We’d love your help. Let us know what’s wrong with this preview of Scions by James Wolanyk. Three years have passed since the devastation of Golyna. Anna, once the maker of immortals, continues to fight the evil she unwillingly created through her rune-carving magic. Secreted away in an isolated mountain monastery, she works as a teacher to young scribes, guiding them toward runes that foster peace rather than endless war. So when the tracker who murdered her bro Three years have passed since the devastation of Golyna. Anna, once the maker of immortals, continues to fight the evil she unwillingly created through her rune-carving magic. Secreted away in an isolated mountain monastery, she works as a teacher to young scribes, guiding them toward runes that foster peace rather than endless war. So when the tracker who murdered her brother comes to Anna’s redoubt, begging for his eternal runes to be undone, Anna agrees to grant his wish on one condition—that he aid her in rooting out the remnants of Volna, a genocidal regime bent on destruction. To ask other readers questions about Scions, please sign up. James did it again!!!!! The last novel in the Scribe Cycle, Scions, was AMAZING. I was honored with and advanced copy, and it doesn't disappoint. I HATED that the story ended. The characters are strong, ferocious and determined. There wasn't a point in the story that I hated (the ending...as stated above...it's GREAT). The world that James created is fantastic. What is amazing is that the characters and world go together. They don't feel forced, which tends to happen in this genre...great job Ja James did it again!!!!! 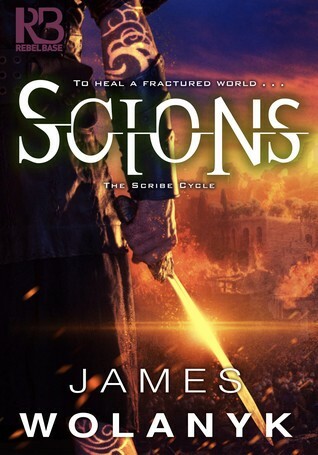 The last novel in the Scribe Cycle, Scions, was AMAZING. I was honored with and advanced copy, and it doesn't disappoint. I HATED that the story ended. The characters are strong, ferocious and determined. There wasn't a point in the story that I hated (the ending...as stated above...it's GREAT). I'm late the game and missed the first 2 books in series. So I definitely missed a lot, and was at a distinct disadvantage in terms of potential enjoyment of the content. That said, I did enjoy the book. It was violent at times, but appropriate to the story. Good characters, good plot. I liked Anna in particular. The author has a lot of talent, and I'll be circling back to catch up on his other work. There were a lot of formatting issues with the advanced digital copy, but I'm sure that will be c I'm late the game and missed the first 2 books in series. So I definitely missed a lot, and was at a distinct disadvantage in terms of potential enjoyment of the content. That said, I did enjoy the book. It was violent at times, but appropriate to the story. Good characters, good plot. I liked Anna in particular. The author has a lot of talent, and I'll be circling back to catch up on his other work.